The work Sir Jinx did with Ice Cube on AmeriKKKa’s Most Wanted, the Kill at Will EP, and Death Certificate, makes him a pretty significant part of Hip Hop history. Add in the assistance he provided on The Predator and Lethal Injection, and you can say he’s been involved in some of the most important works from one of the most important artists in Hip Hop. 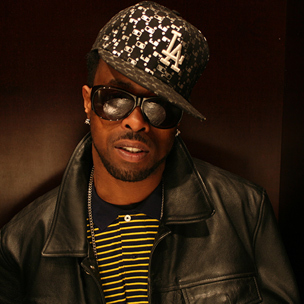 However, add in the fact Sir Jinx played in integral role in the building of a small studio inside of Long Beach, California’s VIP records, and now you have Sir Jinx being partially responsible for the recording of the demo that would launch the career of Snoop Dogg. The latter would play a major role on The Chronic and is enjoying a legendary career of his own. Stopping there would ignore the fact that before the recording of the classic “93 Til Infinity,” it was Sir Jinx that was working with Del The Funky Homosapien and Souls of Mischief, even attempting to sign them to Ruthless Records. Only acknowledging Jinx’s accomplishments on the West Coast would leave out his work with Kool G Rap. Needless to say, your favorite rapper’s favorite rapper probably wouldn’t be who he was had it not been for Sir Jinx—regardless of who your favorite rapper is, or where he comes from. With the release of a new compilation album, Sir Jinx Presents..The Gifted & The Privilege, Jinx is attempting to merge his star-studded resume of Golden Era work with a mentality very much rooted in 2014. During an exclusive Q&A session, Jinx broke down all aspects of the project and delved into his past, present, and future, as well as that of Hip Hop. HipHopDX: You got in the game, you wanted to get a section of Ruthless, and you’ve done much more. What’s your current motivation with The Gifted and the Privilege? Jinx: Being a platform more than a hustle. The places I’ve been, back in the day, people wasn’t handing out platforms. They was handing out hustles, and hustles fall apart. My heart is the same heart that beat a long time ago. I love the music, I love the entertainment business, and then I like Hip Hop music. Hip Hop is a part of the language that gave me a reason to be in the entertainment business. I still like the movies…I like the whole thing. My language is Hip Hop. That’s where I learn it. At some point, I know I can get in the game with my own language, still go forward, and still compete with the masses. Now, I want to have more and more. Like you said, I started with the Eazy-E thing…that little part. I didn’t get the Eazy thing; I got a platinum record. Then we did Yo-Yo, and we moved Yo-Yo from over there. I’m happy with everything I’ve done. I’m just waiting for some new people, some new competition…let’s make it fair and make some real good money like we did a long time ago. DX: What was behind the decision to go with the title The Gifted and the Privilege? What does that title mean to you? Sir Jinx: It’s like a compilation linking the streets—a lot of the cats I was dealing with—with local people that perform, plus I had music with dudes that were already established. I kind of mixed those two together so one could get something from the other. That’s The Gifted and the Privilege. DX: You have features from Snoop Dogg, Ras Kass, Game and more. With all the artists you’ve worked with, what was with the decision to choose these artists for this project? Jinx: The other albums I put together were different. I don’t actually choose the artists, the playlists chooses the artists. I’m dealing with a lot of different artists that have a lot of different types of music. Some artists are good, but don’t have the songs to accommodate the playlists. With this, I’m making sure the playlist is right on point, just like AmeriKKKa’s Most Wanted or Death Certificate. Just like those albums, the playlists makes people like songs they might not ordinarily like. You put somebody next to a Snoop Dogg, and they might not have even played it. Music is similar—not similar in sound, but similar in direction. My last album was Landminds, and that was a little bit more conscious, a little bit more R&B, a little bit more of a righteous environment. Gifted and Privilege are the guys that made it through the years being themselves. If you just be yourself, you’re gifted and privileged to be that type of person. That’s how I chose those people. So most of the songs play into the playlists of what I needed. A lot of guys, they give me music, some of it might be Down South oriented, or Pop, Dubstep or something like that. If you give me time, I will make an album that will accommodate that playlist. DX: So you have music coming in all the time, and it’s just like, “This is the playlist direction for this album/compilation, so I’m gonna go with these.” But you may have some heaters hidden in the stash that you’ll use for something else later? Jinx: Exactly. With Half Dead, he submitted his music; some songs went to one list, and some songs went to the next list. Then Ras Kass throws a record in there. Sometimes, people give me a song with them featured on it. I didn’t deal with Ras Kass. Some songs are songs that people got features; you got a feature on it—like Baby S got E-40 and Keak Da Sneak. Those are the songs that Baby S had, but if you start looking at everybody I’m dealing with, we making a new connection out here. I deal with everybody. From 2nd II None, Candyman, and all these different people. Everybody is kind of running on their own direction. With this new Internet situation going on, we can all link together and sell music like back in the day, with the K-Tels, and the Hey Love compilations—where people would listen to those compilations to hear new versions of love songs or disco singles. Now you don’t even have to look so far to find the music that I’m trying to put out. If somebody tries to go to a major label, they probably wouldn’t give them a deal. But if they link together on these songs, the record labels might see their vision, and see that there are more people that do their direction and their type of music. So everybody isn’t pigeonholed to do the same type of music. That’s what kind of killed the West Coast; everybody started shooting for that same outcome. With this situation, I’m giving everybody a chance. The person that was in the rear subsequently ends up in the front row. DX: You brought up how now with the Internet, people have access to all sorts of stuff, and you can drop different types of projects. How do you feel about the Internet’s effect on West Coast music? Jinx: With the Internet being a main factor, it took a lot of the power and control away from the major labels. Now the artist can develop himself, and he can get out there and hear firsthand feedback rather than smokescreens from a record label that’s just telling him anything. You can see exactly the kind of numbers you’re doing on the Internet. You can see who your fan base is. It’s like fan mail…before the label had control of your fans. The record label’s address was on the back, and you’d write to the artist there. Nine times out of 10, the artists never got it. You lose your relationship with the record label, and immediately you lose the connection with the fans. Now with the Internet, they cut that all out. Now you have direct connection with each person that buys your material. It’s instant feedback. At some point, it makes a lot of people feel like they can jump out and do it. There’s still a cost, there’s still a budget, and merchandise that can be sold on the Internet. It gives the artists their own power to be able to stand up if they want to. They don’t have to follow behind the major label. DX: How much does that factor into expanding the culture. I’m specifically talking about the ability to get artists like Tyler, The Creator out in the West Coast without having to fit into the West Coast box. Jinx: At one point, it was like, “Oh, gangbanging!” Everybody wanted to know about it. If you weren’t a gangbanging rapper or a gangster rapper, you could lose a deal. You could lose your opportunity. Now, the Internet isn’t based on one type of music, or type of artist. You can find your fan base from Canada, to Australia or anywhere. That’s why I make albums like this. I wasn’t gonna deprive myself, because I knew there was gonna be somebody out there that really wants to hear this music that’s getting deprived of what they want to hear, because the majors are pushing them another type of music. They’re like, “Wait…I still like that type of music!” Music is like clothes; it may go out of style, but some people still like to wear it. So you can’t say that this style of music is just over with because we have another genre of music popping. Nah, it’s still popping. There still places in the world that are still getting introduced to Hip Hop that still don’t’ know about a Snoop Dogg or Jay Z. I’m willing to sell music to them forever. Dealing with the Internet, there is all types of music I never knew existed. Even when I was doing my sample thing, I know way more about music now with the Internet than I did when I was being handfed by the people that were in front of me at the time. DX: Whether it’s by talking with people like Lil Half Dead, Jayo Felony or VIP Records’ Kelvin Anderson, your name pops up often. In terms of covering such a huge scope of music, how would you compare the current situation with TDE to when Snoop and Dr. Dre emerged? Jinx: It’s not the same, because Kendrick Lamar had to do more than what Snoop had to do. Back in the day, you only had one direction. Back in the S.O.L.A.R. building, that was only one beacon in thousands of miles of water. At some point, Kendrick Lamar had to do his thing on the Internet and reach these people without that. Snoop immediately jumped on to one Dr. Dre situation, and there were no other options. Kendrick Lamar has a whole bunch of options to make his music any way he wants, but he captured the new West Coast without being under that umbrella of where we got stuck at with everybody wanting to do gangster music. DX: With all the artists you’ve worked with, what is it that makes you work with a newer artist. What is it you look for in a newer artist? Jinx: Confidence. An artist has to have confidence. He also has to know a little bit of research. Some artist that are really, really far and advanced in writing, sometimes don’t have the confidence. They might have the penmanship and the cadence, but they might not have that confidence. You’ll get one dude who jumps out his car, the girls love him, he rhymes horribly, but his confidence is through the roof. This is called the entertainment business not the writing music business. At the end of the day, I’m more selling music, as well as putting music together. The person has gotta have a charisma about him to build himself a brand. Now I understand that. We used to hear that a long time ago from the older guys. Cats didn’t understand, and they’d be like, “I’m not no role model.” Now they understand how they can change people rather than carry on a tradition that’s not good. DX: It’s interesting how necessary that total package is now that rapping is perceived as cool. Jay Z once said that before he was really on, he didn’t want anyone to know he was a rapper, because people looked down on rappers back then at that time. Jinx: Exactly, you was a clown! Looking like a clown got me home safe walking from school to where I used to live. They’d see me with my boom box with the graffiti all on it; I got pants with fresh paint all on it…these dude were walking out very serious about they neighborhood and the people walking through it. Guys from my neighborhood gave me the fist in the air for not getting involved in the gangbanging. They’d say, “Jinx, keep going with that homie.” I’d get a pass. I’d get to walk home because I was doing what I wanted to do. I seen a lot of dudes that didn’t make that walk home. DX: We talk about how in the streets they looked down at rappers, and it was completely different. Now many artists are trying to blend in with the streets. Do you feel like the streets have changed their view of things? Jinx: Now, it’s the other way. Now you can tell who’s the weirdo for real. I’m a weirdo. I’m not dissing nobody, but they used to say I’m a weirdo. Now with the skinny jeans, you can tell them anywhere they go. You say, “Oh…you new school? I know exactly who you are.” They’ll look back at me and say, “I know you too—Kangols, sweat suits, fat laces.” As soon as it was portrayed with dope dealing, pimping, and all this, it was watered down. DX: How do you feel about how Hip Hop has been co-opted into popular culture? Early in the game, when N.W.A was coming out, you’d turn on the TV, and the news would be like, “Ahhh, these guys are terrible!” Now you turn on the TV, and you got Miley Cyrus trying to twerk. Jinx: I love it! I’m a child of Hip Hop, and I feel like a proud dad when I see Miley Cyrus and Justin Bieber. A tear comes to my eyes to see what I made up getting ran until they couldn’t stop it. Back in the day, it was like the F.B.I. and N.W.A… The F.B.I. was gonna stop N.W.A…yeah. The F.B.I. really stopped it. They really did. If they didn’t, these white kids wouldn’t be acting like that. I feel like a proud dad any time I see any other type of person involved in Hip Hop music, using it for Burger King or using it for something. Back in the day, that’s what they were doing to us anyway. It’s the same thing over and over again, but this time I got a brick in the wall. Yes, I was there when Hip Hop started. Yes, I knew it was gonna pop. Yes, I knew Rap people was gonna end up on the golf course. I knew this because there was nothing stronger than what we were doing at the time. There’s still nothing. You got Dubstep creeping up, but it ain’t gonna hold a match to Hip Hop. You got all these club sounds that spin off from Hip Hop, but at the heart of it, I still love that boom bap Hip-Hop. Everybody is chasing that real, heartfelt Hip-Hop, and if you can’t do that, then comes all the side effects. It’s like, “I don’t rap, but I can beatbox and play a tambourine at the same time.” It don’t matter, if you can really rhyme, that’s the essence of what I like. DX: How up to date are you on the New York scene? We talk so much about your involvement in the West, but you’ve been heavy in the game in general. Jinx: I’ve just been doing my thing. I’m sure in your life; you start learning about stuff later. You give it a name later. I’m the finisher… the cleaner that comes in when something is all fucked up. What was that, Pulp Fiction? This is the relationship I have with Xzibit, Kurupt, Jayo Felony, Brother J, and 2nd II None; these are all the new family. That’s what I tell everybody when cats are screaming, “New West.” The “New West” is about the new way we link up with everybody not how you come out on your own. You still gonna have to hold the weight of the West. If you try to do it by yourself, they gonna do you as cold as they did Young MC. When Young MC tried to step out, everybody was against him. Now, everybody [acknowledges] Young MC was a part of the game. That’s the way I like it. He came out so far ahead; he didn’t have nobody to defend him. Now, we’ll put out a person like a Young MC, because we know what genre of music he’s into. He’s not a gangster. He’s not none of that. Right now, that’s how everybody is. It’s becoming the new West, the new family West…how we learning from down South. Them Down South cats don’t even care about if they even like each other or not. They make their web really big and really strong. Down South has taught everybody how to have a relationship in the music industry rather than having beef. They do beef, but they understand the importance of using the people around you and linking up instead of fighting the world. At some point, the West Coast was linking up and doing stuff, then they started fighting the world. With the East Coast, all they had to do was fight the West Coast back in the day. Those were the only people that were opposing us. Instead of us embracing that, we did the same music… We started beefing with each other, amongst each other, then Down South started making so much damn money while everybody was fighting each other. If anybody wants to go against me and tell me that’s not right, I been here since day one. I seen how New York was the big brother of Hip Hop. Then L.A. came along, and we was the little brother. So of course, they wanted us to be up to par on the lyrics and stuff like that. New York was doing music the way they was doing it, and they wasn’t making music to sell music. They was making it to establish Hip Hop. When it came to the West Coast, we was showing them how to sell it. So now, Down South learned how to put it on the conveyor belt and sell it by the millions. You tell me that the early days of New York, they were selling Hip Hop? I doubt it. When the West Coast got involved, it became more commercial, because it wasn’t boom bap; it wasn’t so underground. When it came to the West Coast, we added music to it. Back in the East coast, it was just drums. You had a few songs that had music in it, but the Hip Hop jams from back in the day, with LL Cool J, they didn’t have music. He had one song, “I Need Love,” but the rest of them was just drums. We brought the party, having fun and turning it into some fun stuff. Down South…they took it, and figured out they didn’t want to fight each other over it. They let everybody get on. DX: Where do you feel the West stands now in the scope of things? Jinx: We’re learning. Everybody is sitting on the sideline mad because we dropped the ball back in ‘97, and we didn’t put enough people on to hold down the wave. Now you see these new groups coming on, and they got front liners! They front liners aren’t slumps, to where it’s two good emcees, and the rest are bogus. These new West Coast groups have front lines that are serious. Another thing: back in the day a lot of cats couldn’t deal with each other. Now, in the West Coast, a lot of cats aren’t dealing with a neighborhood boundary to subsequently make them not do a feature. A lot of the dudes now that are in the music industry, you can go to they house and not deal with a gang or something like that. If I want to deal with a Myka 9 or anybody, it won’t be a gang issue. If I want to deal with a Medusa—all these people who have nothing to do with my music, but I still want to build with them—that can be done more today than it ever was. You couldn’t just go anywhere talking about Hip Hop unless the gang gave you a pass; otherwise you’d get beat up and robbed. That’s not what it’s like today. DX: Why do you think that’s changed to where you can have a Jay Rock and Nipsey hu$$le working together, as opposed to how it was back in the day? Jinx: They separated that gangster stuff and the Hip Hop by knowing they can make money together. Back in the day, when they put it all together, you can’t make no money like that. Rap music makes way more money than gangbanging. I know that for a fact. Most of the dudes realized their rights and their wrongs. Maybe sometimes the dude that was they enemy may have held them down more than anybody who supposedly had they back. Rap music changes very fast. One day you’ll be on top, and one day you won’t. So I always tell rappers don’t put the gangbanging in your raps, because it’ll box you in to where you can and can’t go. If you can rap really good, any gang member will like you. Any real thug will like you if you spit that real. But you don’t have to be affiliated with something to make somebody like you. If your talk is good, your talk is good. That’s what we went through in the beginning of the West Coast; everybody thought they had to be affiliated to be accepted. Now, it’s not like that. I’m a caregiver to Hip Hop. When it gets out of hand, you gotta realize, Hip Hop was a sport that was made with no adults. So all the people that made it was kids, and the kids made the rules of it. So this is why it goes all over the place, because it doesn’t have a parent. Now, Jay Z, Puffy and all these guys that are older are pushing it in a quality direction. When it was ran by kids, the quality wasn’t as good as Jay Z music is today. Jay Z music and Eminem music sounds like Journey and Phil Collins. They done pushed Rap into a whole new ball park. That’s why I love it. That’s why I know it’s gonna be up there. We just gotta take care of it. DX: So you’re saying now there are gatekeepers? Jinx: Yeah. It all goes together. Look what Jay Z is doing to these people’s lives that are jumping on stage rapping with him. That’s gonna change they life forever. Now you got fathers of Hip Hop—Mello Man Ace is the godfather of Latin Rap. Snoop Dogg is the godfather, you know? Now, it’s different than a long time ago when they’d let anybody on…well, not anybody. Now, Jay Z knows, and he’s putting on Rihanna. He’s looking for other people with talent. That’s a good thing for Rap.